Morrissey will play his first concerts of 2009 in New Zealand. January shows are booked in Christchurch, Wellington, Auckland and Dunedin. From here, Morrissey will travel to Australia where concerts are booked in Brisbane, Sydney, Melbourne and Adelaide. Morrissey is now managed by Irving Azoff, at 10866 Wilshire blvd, suite 250, Los Angeles CA 90024. 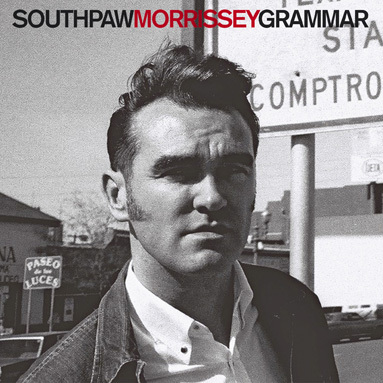 BMG have announced 26 January 2009 as the release date for the re-issued 'Southpaw grammar'. The album also features new sleeve artwork by Anthony Lui, including previously unseen photographs by Linder Sterling. Anthony had also designed the sleeves for 'Ringleader of the Tormentors,' 'Live at Earls Court' and 'Greatest hits' plus the last eleven UK singles. Tracks 4, 8 and 11 of the new 'Southpaw grammar' are previously unreleased. US dates will now precede the projected tours of New Zealand and Australia for 2009. Years of refusal now has a release date of February 23rd, which will also see the start of a lengthy US tour. New Zealand and Australia will now follow the US dates. BMG issue a redesigned and re-mastered Southpaw Grammar, and Universal issue a redesigned and re-mastered Maladjusted one week after Years of refusal. The new album is preceded by I'm Throwing My Arms Around Paris as a single release. CD1 and CD2 will be supported by two new songs Because of my poor education and Shame is the name. Both songs were recorded with Jerry Finn as part of the refusal sessions, and Shame is the name features additional vocals by Chrissie Hynde. Yay! Thats so exciting! I want to seeee him again! Yaaaay US tour... no, screw that, YAY California part of the tour!! Our Aussie members would be delighted with this news, too bad most of them stopped posting, we had a 3 or 4 really active Australain members here but they somehow vanished. Hopefully he does not wait too long to announce the European dates now. 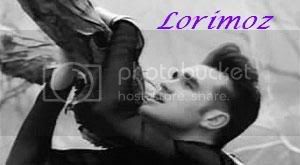 Moz, please come to Czech Republic, we need some good music here!! I am tired of all those bars playing Right Said Fred, Madonna, Wham and Modern Talking ... Come to Prague!!! 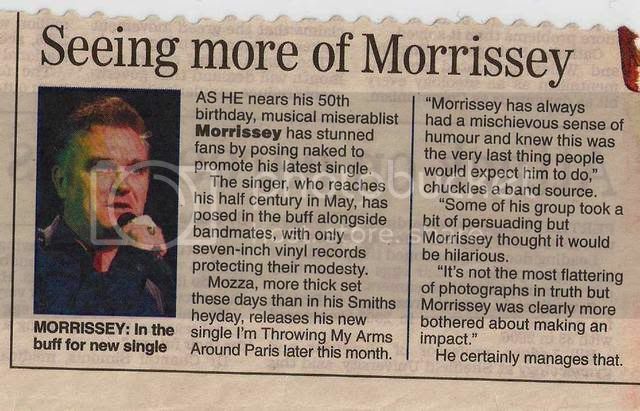 Morrissey's new single 'I'm Throwing My Arms Around Paris' is released on Monday 9th February and will be available on 7", two CDs and download. The single will come complete with a full set of b-sides including two new songs 'Because Of My Poor Education' and 'Shame Is The Name', the latter featuring additional vocals by Chrissie Hynde. The 7" is backed by a very special live version of the classic 'Death Of A Disco Dancer'. Wow- that video is dull as hell- so blank and bare. The necklace is also weird, but the important thing is that the song is going to be stuck in my head (and heart ) for goodness knows how long. Weird song, I like it. It's an ok video, nothing fantastic or done on a mega budget. If it gets played on TMF, MTV or whatever, it will serve its purpouse. I like Moz in jeans and in blue but not too keen on that amount of eyeshadow. The addition of the dogs made the video a bit different otherwise we would have just the lads playing a-la-Last-of-the-famous. Glad Chris Pooley is not in it. He might be a talented musician in his own rights but definitely not Mikey Farrell. "Best Friend on the Payroll"
That is one of his best titles to date, and that says a lot. The inner sleeve of the new single ? ?